Bright clusters of golden flowers adorn this medium shrub in spring, followed by edible dark blue autumn berries that look like grapes. 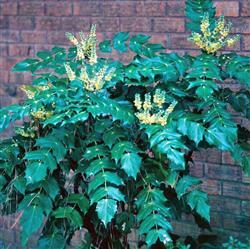 New foliage grows in a coppery red color and turns green as it matures. The leaves resemble holly and so this dense shrub provides interest in every season. Use it as a low screen or informal hedge or in a border mixed with other native perennials. Hybrid, F2; origin = seedling (1962) M. piperiana x (M.aquifolium x amplectans); intro Rancho Santa Ana Botanic Garden 1964.